Featuring famous Derawan Islands, Berau District has gained more popularity among tourists over time. Yet, it is only the beginning because more interesting places are still available for passionate travelers. 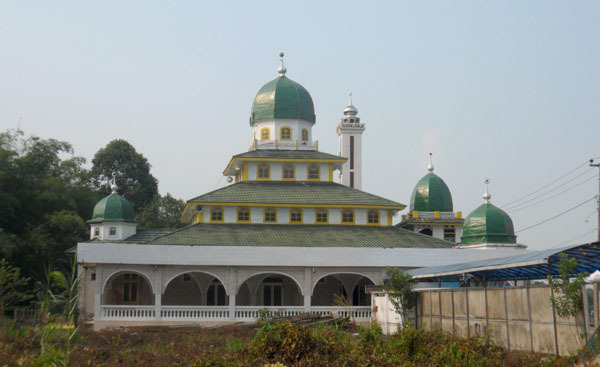 For those who are into a religious tour, a historical and stunning mosque resides in Gunung Tabur Sub-district. The name is Jami Imanuddin and it is one of the most famous structures in Berau District aside from Batiwakkal Museum. The fact is it is the oldest mosque in Gunung Tabur, offering a fascinating history and unique design. Unfortunately, it isn’t used as a place for worshiping anymore. Instead, it becomes a new tourist spot in Berau! Regarded as the oldest mosque in Gunung Tabur Sub-district, Jami Imanudding Mosque indeed looks old and rustic. Still, it appears majestic from outside and clean from inside. There is even a garden located in front of the building, featuring some plants, grasses, flowers, bushes, and small trees. The size of the mosque is not quite big but is offers a spacious feeling to visitors. It features several colors like white, light green, and dark green! No wonder, it combines well with the garden. Another important feature is the tower, which is not quite tall. The locals stopped using the mosque as a place for worshipping since 1990. One of the reasons is the presence of a new mosque called Al-Hijrah, which resides near to Gunung Tabur Palace. Today, the building has become a historical site, on which travelers can explore. According to the locals, the mosque was once used by the local kings either to conduct a meeting or worshipping. Due to such historical value, the local government decided not to demolish it despite its inactivity. On the other hand, it becomes a new attraction in Berau District. Once visitors enter the mosque, they might feel its rustic and old nuance. Still, the mouse is well-kept and clean, so tourists would feel comfortable in it. Apart from sightseeing, taking pictures are allowed there. In fact, no fee is required before entering the mosque. What people need to do is to avoid littering or causing havoc either outside or inside the building. Due to its historical value, everyone should respect it well. It is also recommended to come with a tour guide, as he may tell history regarding Jami Imanuddin Mosque. It is said the mosque was under bad circumstances back then, during the invasion of the Dutch and Japan. According to history, Gunung Tabur Palace was once bombed by the enemy. Almost all structures were destroyed! Fortunately, Jami Mosque was one of the buildings that survived. There is even a history related to its tower. In the past, people used to climb the tower to shout Adzan (the sign of Shalat’s time). No wonder, no advanced technology like speakers back then. Well, with all of its history, the mosque remains famous among the locals and tourists, no? For outsiders, they can take an airplane to Sultan Aji Muhammad Airport, which is located in Balikpapan City. From there, the next destination is Gunung Tabur Sub-district. It may take roughly 17 hours! Despite the long trip, it is going to be a worthy vacation for everyone.